So much for heading off-grid to get some writing done. Who am I kidding? I’m not a writer. I’m a bad typer at best. It’s all very well heading out to darkest Norfolk thinking that with fewer online distractions I can work better. But I work in multimedia. I need access to the internet to research. I need access to my online backups and clouds resources. I need to upload.. download.. browse.. link to and archive. All at the same time. I’ve had some amazing adventures in the wilds attempting to connect and share my surroundings from isolated locations. I’ve not seriously headed to the sticks in order to get some work done before. I have resulted to suspending my Vodafone MiFi inside a steamer. By rotating it slowly the metal pan acts like a parabolic dish and I can pick up a 3G signal. 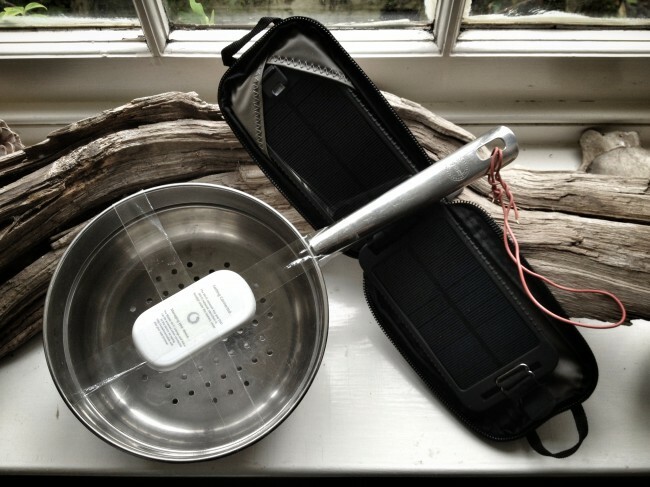 I used Powermonkey’s solarmonkey adventurer to keep the MiFi powered when away from a plug socket. With the 3G signal feeding WiFi to my laptop and phone I just managed to upload a video that I forgot about and needed to go live today. It didn’t take me long to realise that the distraction part of the internet is not the problem. My lack of discipline and shoddy workflow is the problem. At home, working in my shed, there are moments when it’s easy for me to get distracted. My connection is not fast and when uploading or downloading it’s easy to click on a tab to see what’s happening in the realtime world of the always on. In reality it’s not a log cabin in the woods I need to be able to focus on my work. It’s a bare desk in an empty space with my laptop plugged into a blisteringly fast data connection. And coffee. Actually. With a connection that fast I’d possible have my stuff done by lunch so maybe the log cabin is the perfect spot. By a lake. I wonder how long before the UK gets that kind of connectivity into it’s remote spaces? In the meantime and from now on, I’ll choose fat pipes over off grid. Unless of course adventure is on the top of my to-do list.